I work hard to keep my calendar somewhat clear, but things come up over which I have little or no control. As our days get warmer and summer approaches I watch for mailings from the city, looking for one that details the summer concert series. I’m a big fan of Music in the Park, in particular, and when the schedule is published I immediately add each concert my calendar. This not only reminds me to attend each Wednesday night concert, but also makes it easy for me to see when another event will conflict with one of them. I had just such a conflict this week, one that I suspected was more important than the concert but one that I found myself waffling about even so. 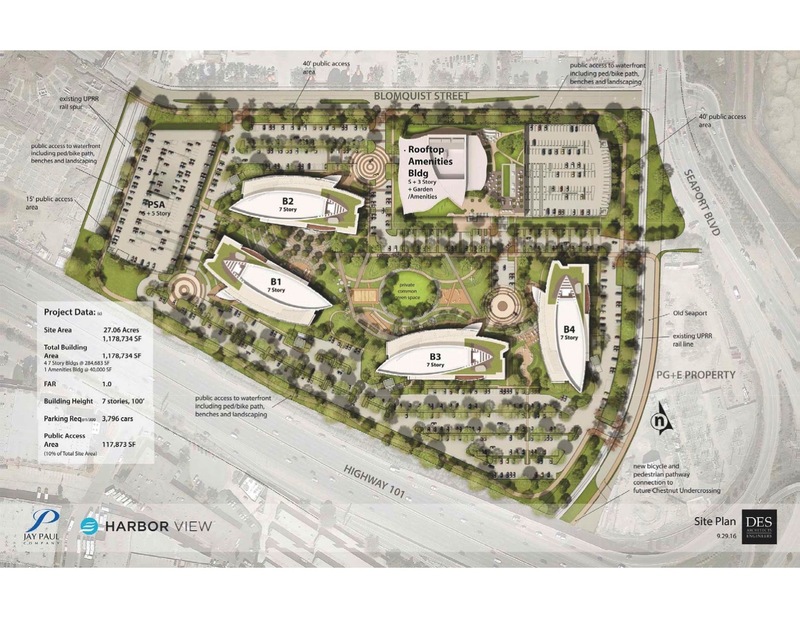 The conflict this week was a gathering in which representatives of the developer of the proposed Harbor View Place project were presenting some of the details of their revised project proposal. The gathering was scheduled for Wednesday, July 12, from 6-8 p.m., at the Highland Community Club on Fernside Street—exactly when this week’s concert was to take place. Fortunately, the Harbor View Place event was not a formal meeting that began at six and ran until eight. Instead, interested residents were invited to “drop in” any time during that period, and stay as long as they liked. Hoping that I could just drop by, say hello, and pick up some literature, I decided to have my cake and eat it too: to attend the concert as usual, and then duck out at seven to “drop in” on the Harbor View Place meeting. With any luck, I hoped to be back before the band played their final song. The Harbor View Place “meeting” consisted of about a dozen presentation boards on easels arranged around the room, along with a handful of representatives from the San Francisco-based Jay Paul Company stationed at various points ready to explain the boards and engage with community members. When I got to the Highland Community Club there were perhaps twenty or so community members looking at the boards and asking questions. I don’t believe that there were handouts; if there were they were gone by the time I got there. Thus I contented myself with taking photographs of the boards and talking to a couple of the folks from Jay Paul Co.
Only two or three of the boards presented information on the project itself. 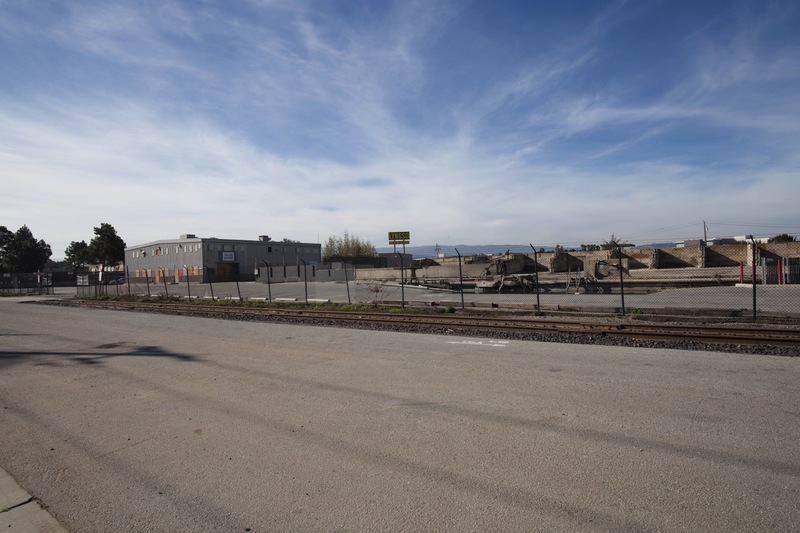 The majority were focused on ways that Redwood City would benefit if the project were to be built—and the considerable costs that would be borne by Jay Paul Company to fund those benefits. Two highlighted philanthropy of particular interest to Jay Paul: one board showed off the recent renovation of the Boys & Girls Clubs of the Peninsula’s Mervin G. Morris Clubhouse/Forest High School Center (located in Hoover Park), funded by a $4.8 million charitable gift from Jay Paul and his company (the actual work was done by Jay Paul Company and Level 10, their associated construction company), while the other highlighted additional giving—totaling $1.1 million—by Jay Paul to Redwood City youth programs focused on education and reading. At the end of the event participants were asked—if they were so inclined—to sign a card showing support for the initiating of a General Plan amendment that would be needed to allow this particular project to proceed. Folks from Jay Paul were careful to note that support for the amendment (which I’ll go into shortly) did not indicate support for the project itself: Jay Paul Company would still have to commission an Environmental Impact Report (EIR), and both the EIR and the project would need to be approved by the Architectural Advisory Committee, the Planning Commission, and the City Council—all assuming that the general plan amendment was written, reviewed, and approved, of course. Just so we are clear, the project that Jay Paul Company is hoping to build is a large office complex on roughly 27 acres of land northeast of Highway 101, where the Malibu entertainment center and Lyngso Garden Materials once stood. The property, which consists of some seven separate parcels, is bounded by Highway 101, Seaport Boulevard, Blomquist Street, and the new Maguire Correctional Facility (which sits on Maple Street). Jay Paul Company has been planning this project for some time now: they purchased the properties over a span of years, starting in September 2013 (when they purchased the Malibu Castle Golf & Games property, the Graniterock Building Supplies property, and the Malibu Grand Prix property) and ending in April 2016, when they purchased the Lyngso Garden Materials property. In July 2014 Jay Paul Company submitted an initial application for the project to the city. Because the property lies within Inner Harbor Plan Area, the project was added to the then-in-development Inner Harbor Specific Plan. However, three years of meetings and much hard work on the part of the Inner Harbor Task Force was not enough to produce a final plan for the Inner Harbor. Although a draft version of the plan and a draft version of an Environmental Impact Report [pdf link] were produced in October 2015, work on final versions—work that is now within the purview of the Planning Commission—appears to have ground to a halt. Upon recommendations by both the City Council and the Planning Commission, Jay Paul Company withdrew their property from the Inner Harbor Specific Plan Area and in September of 2016 submitted to the city a somewhat scaled-down plan along with a request to initiate an amendment to the General Plan and Zoning Map. The plan and zoning changes are needed because what Jay Paul Co. is proposing—an office complex—is incompatible with the current General Plan and zoning for the area. The property is currently zoned Light Industrial (technically, I believe it is “Industrial-Restricted”) which at first glance seems incompatible with many of its former uses. Neither the Malibu operations, the two building supply firms that were once on two of the parcels, nor Lyngso Garden Materials fall within the regular permitted uses for this zoning, which includes (among other things) machine shops and laboratories; warehouses; cabinet shops, electrical, plumbing, or heating shops, bakeries, canneries, bottling plants; and automobile, truck, trailer, boat, plane, or heavy equipment establishments, including major repair facilities. However, continued reading of the zoning law reveals that other uses are conditionally allowed, including outdoor commercial recreation facilities, “operation of amusement games at a place of business that operates five (5) or more of such games, the operation of which is the primary source of revenue for such business”; and building material, building equipment, feed, or fuels sales yards. Those prior uses were indeed allowed, then, but offices of the type that Jay Paul Company proposes to build most definitely are not. The purpose of the Commercial Park Zoning District is to provide areas appropriate for large-scale corporate offices, research and technology offices, and administrative and professional offices in a campus-like environment, to promote the development of employment and administrative activities, and serve local and regional markets. Limited accessory financial, retail, service, and lodging uses are permitted. Development in the shoreline locations of the Commercial Park Zoning District should react to the Bay location and the provision of trails and pedestrian access to the shoreline is strongly encouraged. At their November 15, 2016 meeting the Planning Commission considered a request from Jay Paul Company to initiate the change process. The request was not to actually make the change, but merely to instruct city staff to consider the implications of changing the land use designation and to write a draft amendment. That amendment would then be taken up by the appropriate body (the Planning Commission or the City Council), giving that body a chance to hear from the public and consider the merits of the change before approving or denying it. The Planning Commission, however, declined to allow the process to go forward. Since then Jay Paul Company has been working to drum up public support for initiating the change to the General Plan and Zoning Map, and has asked the City Council to weigh in on the issue. They are currently scheduled to address the City Council at their regularly scheduled July 24 meeting—which should prove interesting. Rather than just pay an Affordable Housing Impact Fee, Jay Paul Company proposes to not only pay the $15.8 million that this project would require but would also try to acquire land for an affordable housing project and work with an appropriate developer to actually get the housing built. $10 million to help get the Woodside/101 Interchange project off the ground. $10.1 million for the Blomquist Bridge & Street Extension. Jay Paul Co. has offered to initially fully fund the project so to enable this vital link to be built in a timely fashion, and accept reimbursement for the extra cost over time. $2.1 million to rework nearby streets and to add new bike paths. $5 million towards the creation of a public park in the Inner Harbor area (a park which would be designed and built by the city). $2.25 million to help create a new free public shuttle that would likely run between downtown and various points within the waterfront area, such as the project site, the Port of Redwood City, and Pacific Shores (the large office development at the end of Seaport Boulevard). This is independent of the Caltrain commuter shuttle that they would also be helping to fund. About 10% of the project’s 27 acres would be open to the public. This land would form a perimeter around the project and would contain walking and bicycling paths. Jay Paul Co. estimates that if this project were built, it would generate some $3.6 million in annual property taxes, which of course would benefit both the city and our local schools. That all adds up to a rather tempting bundle of incentives, which is presumably why Jay Paul Company chose to emphasize them at the meeting rather than the project itself. Redwood City is working to develop a city-wide transportation plan, and has been seeking public input. If you haven’t already done so, they’d like you to complete a brief online survey before July 21 that attempts to capture your thoughts and ideas on transportation issues within the city—including specific places needing improvement. To take the survey go here: https://maptionnaire.com/en/2649. More information on the Citywide Transportation Plan can be found at http://www.redwoodcity.org/city-hall/current-projects/infrastructure-projects?id=117. Next weekend (the 21st and 22nd) is the PAL Blues, Music, ARTS, and BBQ Festival. If this is your kind of thing, put it on your calendar and drop by Redwood City’s Courthouse Square on either and both of those days. More information, including a list of performers and a complete schedule, can be found at http://www.redwoodcitypal.com/blues/. I hadn’t heard about that–thanks so much for letting me know! I think this project is a wonderful idea. I drive past that empty lot on the way to work every morning. High tech office space is in high demand in Silicon Valley. I think Redwood City should be jumping for joy at the fact that massive tech companies are interested in moving here. Right away there will be some strain on the housing market, but as more houses and apartments are built it will eventually even out and we will be happy we built Harbor View instead of leaving it as a dirt patch. Thank you so much for your comment! With this blog I try to remain neutral and simply present the facts, allowing you, the readers, to come to your own conclusions. This is clearly going to be a very contentious issue, and I was hoping that the comment wouldn’t all be one-sided. I very much appreciate it when folks such as yourself are willing to stand up for the the other side. The July 24 City Council meeting should be a very interesting watch indeed. In my view Jay Paul should provide one housing unit for each job that this project will create. Anything less contributes to the jobs-housing imbalance already suffered by this region. Lately, much attention has been focused by some on policies such as rent control and just cause eviction requirements. It would be good to see the people who push these initiatives fight projects such as this rather than pursue policies that involve the government regulating prices property owners can charge others for using their property. In addition to driving up the cost of housing this project will undoubtedly further exacerbate the transportation mess we have on the Peninsula. The question to the Planning Commission and City Council is: when is enough, enough? There is absolutely no NEED to amend the General Plan for a project that puts further pressure on the housing market and transportation system. The Planning Commission already agreed with you, it seems. It will be interesting to watch the City Council’s take on it. Aside from the “incentives,” of permit monies and some portion of road work, what is the long-term benefit of this project, both for the city and the region? I can see the costs in huge traffic impacts and more workers needing housing, but would there be ANY benefit? That complex of office buildings at the end of Seaport Blvd. stood empty for a long time… are they full and bustling with activity now? Can the Woodside/101/Seaport interchange actually bear any more strain? We know that our region is due for a massive earthquake… do we have the right to place more people out on bay fill? Increased tax monies are probably the largest benefit that those of us who won’t be working in the proposed buildings will likely see. Whether that is enough to offset the costs, though, is very much worthy of debate. As for Pacific Shores–the large complex at the end of Seaport, which incidentally was also built by Jay Paul Co.–it has been full for a number of years now, and thanks to Google (who bought a number of the complex’s buildings) might be expanding in the next couple of years. Can the Woodside/101 interchange bear more strain? I think most people agree that it cannot, which is the reason that a revamp of the interchange is being proposed. Of course, that is a complex effort that will take many years to come to fruition. Despite Jay Paul’s attempt to “buy” support for Harbor View Place, it is absolutely the wrong project for the location. This is a truly MASSIVE project! At 1,300,000 sq ft, it is 4x the size of the Crossing 900 (“Box”) building! That’s enough for 8,500 workers. And there would be over 4,000 parking spaces. Adding office space without adding an equal amount of housing will only drive housing costs even higher and force more workers to commute into the Peninsula from far away. Since the project is not near the train or other public transit, a high proportion of workers will drive on 101 — which is already a disaster. Redwood City should be building more housing rather than more offices. And those offices that are built should be within walking distance of the train station to minimize traffic impact.